The American Music Awards (AMAs) is an annual American music awards show. Unlike the Grammys, which are awarded by members of the Recording Academy, the AMAs are determined by the public and fans. The 2019 American Music Awards has the gorgeous music party of the favorite singers and best songs. Taylor Swift and Camila Cabello lead the night this year. Find you idol? On the live performance lineup, we can see Taylor Swift, Jennifer Lopez, Cardi B, Camila Cabello, and more, and also the Tracee Ellis Ross hosting the fest. Wanna watch the full live performance? 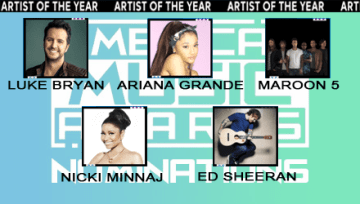 The 2019 American Music Awards video download also help you to learn the 2018 AMAs winners and enjoy the live performance on iPhone iPad or Android devices. Download 2019 American Music Awards Nominated Songs and Live Performance Now! With the ongoning of 2018 American Music Awards, the 2018 AMAs winners are annnunced one after another; the gorgeous live performances from Taylor Swift, Cardi B, Camila Cabello as well as the stunning red carpet moments etc. attract attentions and set off the stage. You can not only get these 2018 American Music Awards nominated or award-wining songs MP3, MP4 HD music videos download but also live performances download without a hitch. Nevertheless, a video downloader for 2018 American Music Awards video download is essential, which could effortlessly free download 2018 AMAs full live performance, single music videos or MP3 songs. 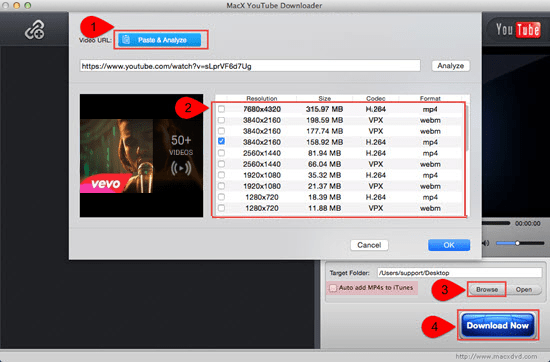 MacX YouTube Downloader is the one you are looking for to free download 2018 American Music Awards video like a charm. It is capable of free downloading 2018 AMAs live performance, nominated songs MP3 MP4, AVI, MOV, HD from YouTube, Vevo, Vimeo, Facebook and 1000+ sites losslessly with fast speed, up to 30 seconds for an ordinary MP4 music video. Besides, the auto add MP4 to iTunes function provides easy access of enjoying your favorite 2019 AMAs songs on iPhone XS/X/8/7/Plus/6s plus, iPad Pro/Mini 4, Samsung etc. 1 Free download the 2019 AMAs video downloader for Mac or for Windows and launch it on your computer. Click "Add Link" button to get ready for your favorite 2019 AMAs video download. Then copy and paste the URL of the target song to the message box and hit "Analyze" button for the songs details. 2Choose the output format, resolution, size for the songs to be downloaded. 3Specify the output folder path to save the target song by clicking "Browse" button. In addition, you can also check the "Auto add MP4 to iTunes" beside for limitless playback on Mac iPhone iPad. 4 Hit "Download Now" to start downloading the song among 2017 AMAs nominees. Then you can use file transfer tool like MacX MediaTrans to transfer downloaded videos songs to iPhone iPad etc. By the way, both 2018 AMAs nominated song MP3 and music videos are available to be downloaded with MacX YouTube Downloader only if the music URL is obtainable. If you find difficult in copying the MP3 URL, downloading the 2018 AMAs music video MP4 HD, and then convert MP4 to MP3 with MacX Video Converter Pro, the advanced edition of this free video downloader seems like a good idea. 1. Tracee Ellis Ross host the 2018 American Music Awards again. 2. Favorite star Taylor Swift was awarded Artist of the Year on the 2018 American Music Awards. 3. Taylor Swift gave stunning performance with hit single "I Did Something Bad", and Cardi B feat. J Balvin & Bad Bunny, "I Like It" was also one of the best performances from 2018 AMA. Just free download 2018 American Music Awards video live performance or highlights to satisfy your curiosity!